The 10 Best Bike Shops in West Virginia! Whether you’re hopping on your bike to commute to work, enjoying a family trip, leisurely riding through a scenic part of the state, or competing in a race, biking is a great activity for everyone. But unless you know everything about maintenance and have a bike that never needs repair, you’ll want to find a shop that offers high quality products and services that keep your special ride in tip top condition. Here are the 10 best bike shops in West Virginia. Located near some of the Mountain State’s best mountain bike trails found in places like Snowshoe, Monongahela National Forest, and Greenbrier State Forest, Appalachian Bicycle Co. in Lewisburg, West Virginia has the goods and services for beginners and expert riders. From tune ups to complete overhauls, certified technicians will get your ride ready for your next great adventure with prices that are budget friendly. Besides offering the best in bikes and riding accessories, Arrowhead Bike Farm in Fayetteville, West Virginia is an adventure outpost with plenty of riding and hiking trails to fit any riding ability. When you’re done with your outdoor adventure, you can relax and enjoy the gorgeous view with great food in the biergarten located on site. This is fun for the whole family. Downtown historic Cairo, West Virginia, is the place to find Country Trails Bikes. Located very close to the local North Bend State Park Rail Trail and the East Coast to West Coast American Discovery Trail, this little shop is a welcome stop for riders. You can rest a while and pick up a snack and water at the General Store, or get a trail map as you start out on your rented bike. With over 30 years’ experience offering excellent bicycle, accessories, and services, Blackwater Bikes in Davis, West Virginia, serves all bike enthusiasts, regardless of their level of ability. They are located in an area of the state with hundreds of bike trails including Blackwater Canyon, Canaan Valley, and Monongahela National Forest. You can get maps, snacks, beverages, and more to make your bike adventure an event to remember. Dirtbean Cafe & Bike Shop in Marlinton, West Virginia, offers Giant-brand rental bikes and various lines of parts and accessories. To make sure your bike is in the best shape for your riding adventure, their repair shop can tune up your bike while you enjoy a snack, coffee, or other treat in the café located on premise. If you’re looking for friendly, knowledgeable folks, great food and drinks, and reasonably priced bike rentals, this is the place for you. One of six nationally-recognized bike shops in the Mountain State, Marathon Bicycle Co. in Fayetteville, West Virginia, has been providing all things related to bicycling around the New River Gorge area for many years. Whether you are new to the outdoor sport or a veteran rider, you will find everything you need at this full-service shop. They have a large selection of bikes and accessories and repair services when needed. Featuring Nike bikes and Pro Mountain Outfitters in Bridgeport, West Virginia, will get you up and riding in no time. A strong support of local cycling events and courses, they carry a complete line of mountain bikes, and can offer advice and recommendations on anything related to bikes and biking in the Mountain State. Selected by the League of American Bicyclists as a national-recognized Bicycle-Friendly Business, New River Bikes in Fayetteville, West Virginia, is known for providing excellent service by a knowledgeable staff for any of your biking needs. From novice to expert, you will be guided to the model and gear that meets your needs. The shop also offers tours around the area and shuttle service is available to the starting point or destination. 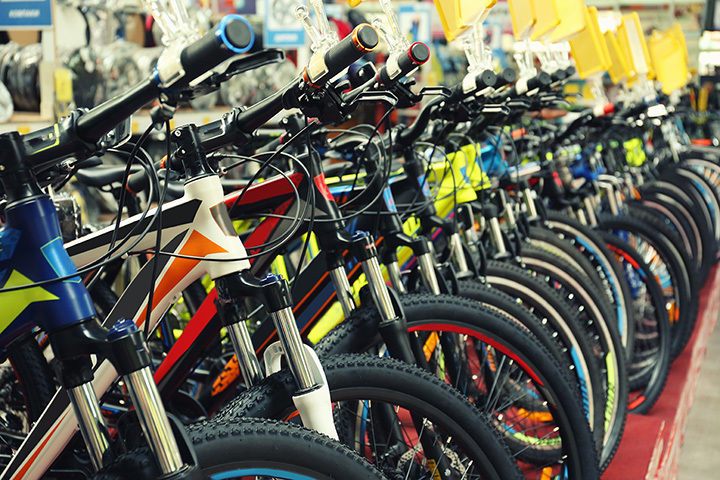 Professional service, access to some of the best bike trails in the state, accessories, parts, and apparel, are just a few of the reasons to check out Pike Street Bikes in Shinnston, West Virginia. Whether you’re shopping for a new bike, looking to upgrade with a trade-in, or just need to have your bike serviced to make sure you’re ready for your ride, the friendly folks at Pike Street Bikes will help you and your entire family be safe and ready. Bike enthusiasts had to travel 30 miles to the closest shop before Fat Tire Cycle opened in Buckhannon, West Virginia in 1988. Seeing the need for a store that supported the popular outdoor activity of mountain biking, this little out of the way shop has become known for their superior service and knowledge. They work with you to find exactly the right size bike, best price range for your budget, accessories that work for you, and make your experience fun and enjoyable.